July 27, 2003, Hadley Peak via "Mosquito Divide"
David Coleman and I figured that even if there wasn't too much skiing left near Hadley Peak (7515 ft), the views of the north side of Mt Baker alone would be worth the effort of the trip. We decided to approach via Cougar Divide, where the trailhead is 500 ft higher and several miles closer to Hadley Peak than the more-common approach from Skyline Divide. Access is from Wells Creek Road 33, which is closed from Nov 1 to July 1 (something about mountain goat breeding habitat). Although it was rough, the road looked like it had seen recent maintenance work and should be passable for most cars. Although reading previous trip reports had prepared us to expect lots of bugs on this trail, we were still shocked when we reached the road end at 4900 ft, and were instantly attacked by scores of mosquitos. Obviously, the namers of "Cougar" Divide chose the wrong predator to honor. Within seconds of opening the door, the car filled with dozens of mosquitos. We huddled inside swatting furiously and even briefly contemplated turning around and going home (if only we had!). Like fools, we decided to go ahead, and slathered on our not-strong-enough-DEET. We charged up the trail at 9 am. The next hour on the unmaintained up-and-down ridgetop trail was a living hell, as mosquitos by the hundreds swarmed around us, constantly in our eyes and nose and mouth. By far the worst backcountry bug experience either of us have yet suffered through. Mercifully we reached the open meadows above timberline near 5700 ft, and the skeeters soon became a horrible fading memory. We followed snow above 6000 ft to the western high point of Chowder Ridge at 6920 ft, cresting the ridge to a stunning panorama of the entire span of the Roosevelt and Coleman Glaciers, including the North Ridge. Wow! Several climbing parties could be seen on the Coleman, the route still looks OK for skiing especially above 7000 ft, but is getting heavily crevassed below that. We spent a leisurely hour on the ridge, as numerous hikers coming over from Skyline Divide joined us (and informed us the bugs weren't too bad over there--damn!). Around 1 pm, we skied down NE into the Dobbs Creek drainage, following a narrow finger of snow into the basin (see photo below) and then out to the snow's end at 5500 ft. Fun skiing, softened just enough to smooth the suncups. A short 50 ft carry was prudent at the bottom of the finger to avoid some sketchy undercut snow above the stream, this will melt out completely within days. We crossed the basin on foot heading east to reach another snow-filled streambed and then cramponed up the prominent NW facing gully towards the Hadley Glacier, aiming for the ridge just east of the peak. We reached the ridge near 7100 by 3 pm, after crossing a few incipient cracks on the glacier, and were treated to a second stunning panorama, from Mt Shuksan all the way along Ptarmigan Ridge to the entirety of the Mazama Glacier and the upper part of Baker's north face. The ski down was pretty good, somewhat runneled and suncupped up high, but quite fine in the 35-40 degree gully from the toe of the glacier down into the basin. We skied out to around 5400 ft in this streambed and loaded up for the hike back up to the trail, joining it at the final 5800 ft saddle on Mosquito Divide. We dreaded the upcoming hour of misery which we knew lay in store for us on the way back to the car. Somehow it wasn't quite as bad as in the morning, but what I wouldn't have given for some real 100% DEET and a good headnet. Totals for the day: about 4000 ft of gain for just over 3000 vft of skiing and nearly the same number of mosquito bites. I'm still nursing the wounds over 24 hrs later. Click here for a double-size version of this photo. Our first run down from Chowder Ridge followed the narrow gully at right. Except for the bugs it seems like a nice trip. If turned into an overnight is there enough diversity in the slopes around Hadley to make it worth it as an overnight? I will try to figure out the route you took by using a map while reading your account. I know it is probably too much to ask for a map with route lined in.... Would I be correct in saying that once on Chowder Ridge or at the end of Cougar Divide the route is faily obvious by dead reconing? Yes, the route is fairly obvious if Hadley Peak is your destination. I'd opt for camping well along the ridgeline far away from any trees. As for skiing, there are some options. 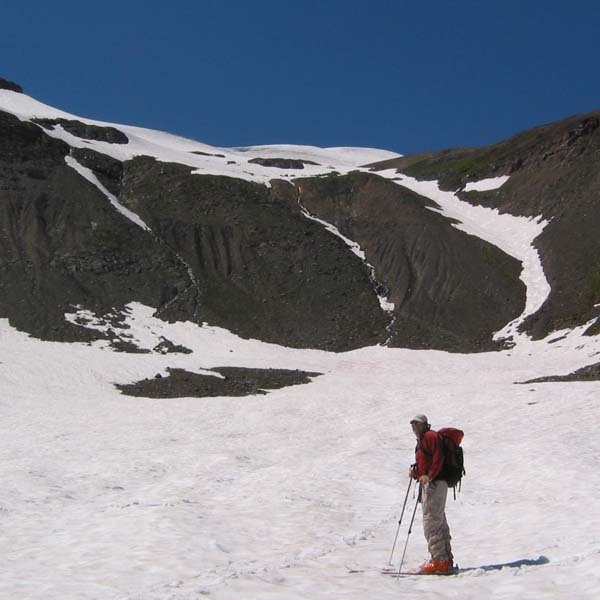 If I were to do an overnight, I would likely access the Mazama Glacier for a ski descent (few runnels, suncups and essentially crevasse free). This can be reached by the ridgeline along Hadley Peak just to the east of the summit pyramid (and assuming you skin/climb up the main NW face of Hadley on the way up). It appears that you could also venture higher up onto the Mazama (i.e. staying on the ridgeline to the south of Hadley Peak) in order to drop in on the lower flanks of the Roosevelt Glacier. This was a view I was hoping for on Sunday, but maybe next time. In my opinion, the skiing isn't worth the punishment the mosquitos dish out. I don't think I'll ever be back via that route. I'd exchange miles along a ridgeline (Skyline Divide) for that torture. The bugs really seemed serious on that trip, almost debilitating. I'll have a good look at the map. I was on Skyline Divide earlier in the season and it did look like it would have added considerable miles to the destination, but for an overnight probably not a big issue. I've walked Cougar Divide several times; twice for the skiing and at least once for the walk itself. The bugs are seldom as bad as you describe. This seems to be peak season in a bad year. FWIW, I was on Skyline Divide Sunday, and while the mosquitoes were perfectly tolerable, the horseflies, deerflies and blackflies were pretty bad, especially late in the day. Given the choice, I'd pick a colder, windier day. Nice scenery up there, bugs or no bugs. It starts spectacular and gets increasingly more so the closer you approach Baker.I've timed both Skyline and Cougar and found them pretty equivalent for access to snowfields along Chowder Ridge. Cougar is just a bit shorter, but the trail and road are not as well maintained, therefore slower. Hey Mark...guess we just missed you. I was wondering about the difference in actual distance. From what I remember, you're out on the ridgeline on Skyline in no time from the car. From there, it's just a long slog along the ridge. Yes, the skeets were close to debilitating. I would venture to guess that we were continuously swormed by a pack of several dozen in terms of actual numbers. No question that the views get evermore impressive as you move south along the ridgeline. As another data point, I'll note that last year when I visited Hadley in mid-August, the mosquitos were equally voracious. Both of my write-ups on the experience mention how bad they were. However, I thought that after getting through the mosquitos, the skiing was quite worthy of the effort. To cope with the mosquitos, one could just start hiking from the car while wearing ski pants, jacket, and head net. I stopped to put on my pants and jacket last year (no head net) midway through the hike. The nylon outer-wear seemed to protect; polypro and deet did not. This action perhaps kept me from going mad and lowered my blood pressure dramatically. Unfortunately, my body temperature shot up. By the time I reached snow, the mosquitos had disappeared. From Hadley, there is nearly 360deg of skiable terrain. There is plenty of terrain there for an overnight. One could also traverse from Hadley over to Coleman Pinacle, though crevasse weaving could be tedious at times. Just bring a tent to keep the bugs out. Bill, thanks for posting those links. You've got some great overviews of the area on the geocities page. I pulled up Amar's large version (July 27, 2003) next to yours (August 16, 2002), and it looks like there was already less coverage at the time of Amar's trip than yours three weeks later. Would you consider posting your overview shots in the Ski Route Photos section (or would it be OK for me to do so)? Amar, same question concerning your photo in this TR (or maybe you have an overview like Bill's from farther north along Cougar Divide)?